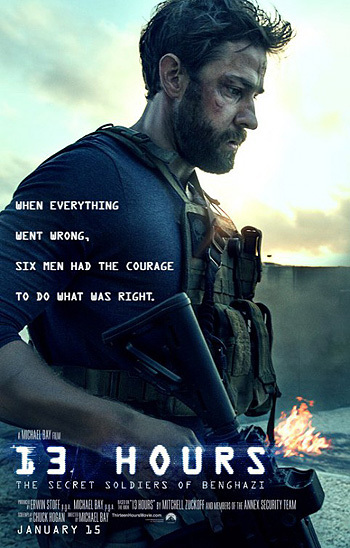 John Krasinski, James Badge Dale and Max Martini star in Michael Bay’s war thriller 13 Hours: The Secret Soldiers of Benghazi, based on the book ’13 Hours’ by Mitchell Zuckoff. Watch the movie trailers below. An American Ambassador is killed during an attack at a U.S. compound in Libya as a security team struggles to make sense out of the chaos. MPAA Rating: R for strong combat violence throughout, bloody images, and language. The gripping true story of six elite ex-military operators assigned to protect the CIA who fought back against overwhelming odds when terrorists attacked a U.S. diplomatic compound on September 11, 2012. Based on the nonfiction book “13 Hours” by New York Times bestselling author Mitchell Zuckoff and Members of the Annex Security Team.